The Palms golf course has undergone an $8.8 million reconstruction in recent years and was redesigned by renowned golf course architect Ross Watson. After its reopening in April 2011, The Palms is considered a championship course rivalling some of the best golf courses in Australia, now ranked in Australian Golf Digest’s Top 50 golf courses. It has a total length of 5904 metres off the championship tees, and has numerous water features and hazards. Tee placements have been designed to suit a variety of playing conditions and a diverse range of players. 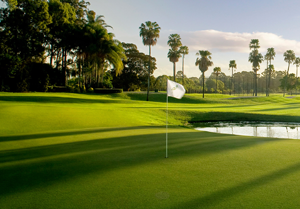 Nestled within century old Cabbage Palms, The Palms golf course is a return to the traditions of the game, with distinctive holes, deep greenside bunkers and boldly contoured greens requiring creative shot making. The Palms is designed to challenge players of all abilities. In the Australian Golf Digest’s recent Top 100 Australian Golf Course rankings, The Palms golf course came in at number 48 and was ranked 37 in the 2018 GOLF Course Guide’s list of the Top 100 Australian golf courses.